The Deer Hunter (1978): Dir. Michael Cimino. Written by: Deric Washburn, from a story by Washburn, Cimino, Louis Garfinkle, and Quinn K. Redeker. Starring: Robert De Niro, Christopher Walken, John Savage, Meryl Streep, and John Cazale. Rated R for graphic violence and strong language. Running time: 182 minutes. The brutal epic of Vietnam was a topical choice for the Academy in 1978. True, the film has maintained its reputation, but far more people are likely to name 1979’s Apocalypse Now as the definitive Vietnam film. 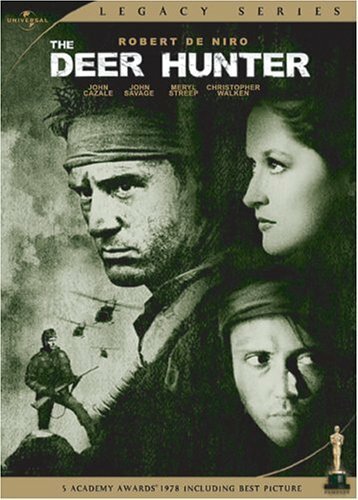 It’s not that The Deer Hunter has lost its potency, but its historical inaccuracy and treatment of Asian characters have certainly docked it points. Following the exploits of a close-knit group of Pennsylvania steelworkers, the film divides the film into three sections: before the war, the inferno of war itself, and the after-effects. Our protagonist is Mike Vronsky, the eponymous deer hunter who becomes a Special Forces officer, returning home irrevocably changed by the war. The Deer Hunter remains strongest perhaps for its sharp observations and compassion for its characters. The first third becomes an exercise in naturalism as we play the bystander to their daily lives, even as we glean barely any insight into their minds. But as the story progresses, we see their personalities when confronted with adversity, particularly in the famous Russian roulette sequence. In a visceral and uncompromising distillation of the Vietnam War, De Niro and his co-stars give raw and indelible performances, no doubt abetted by the extreme conditions they endured. The screenplay effectively captures the awkwardness of returning G.I.s, especially those with post-traumatic stress disorder. Once returned, Mike reunites with his friends that stayed behind, only to realize he can’t possibly share what happened to him. Unfortunately, the film also remains haunted by specters of racism, especially in the Russian roulette scenes. And while that doesn’t throw the film right out, it does keep the film from achieving full credibility. I admire the film perhaps more for its moments than its structure, but what moments they are! They haunt and bleed, ensuring the legacy of Vietnam may never be forgot.